Hopefully, this will eventually look something like this. The pattern is the Rhythm Wrap, from A Treasury of Magical Knitting. The original version is knit in Skacel Evita (40% cotton, 40% acrylic, 20% rayon) and is meant to be a light summer wrap. I do not need a light summer wrap for November in New England. Thus, I am using a beautiful skein of handspun wool/mohair that I bought at Rhinebeck. I should have plenty of yarn for the wrap, but I'm not sure I'll have enough for the fringe, so it may end up fringe-less. We'll see. I have not started work on DH's sweater. No big surprise. DH knows that I dug it out of the Hidden Tub of UFO's, and I will have him try on the body this week so that I can make sure that the sleeves will be long enough. In the meantime, because I don't have enough projects on the needles (stop snickering), I raided the stash this morning and found a couple of skeins of purple Peruvian alpaca that would be perfect to make this cute pilot hat for my nursling (scroll down about three quarters of the page to see the pattern). 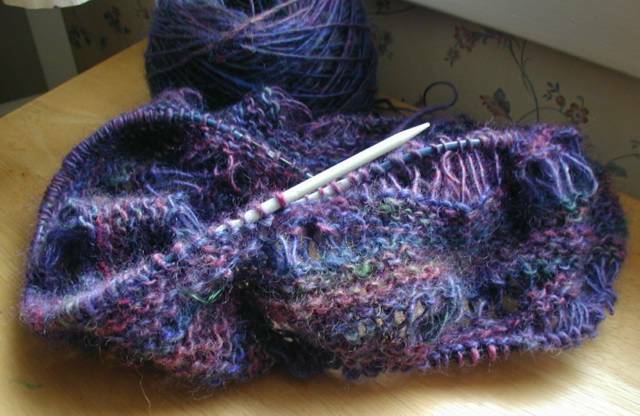 I already have the pattern because I made one for her a few months ago, in a beautiful shade of Noro Kochoron. * The Noro hat came out too big, so it will be next year's hat. So, hopefully I will get lots of knitting time in while visiting my parents over Thanksgiving weekend! *This yarn is soft and scrumptious and yummy, but very expensive (and now discontinued). Thankfully, I found two skeins of it a couple of years ago in a clearance basket for $2 each. They were originally marked $19.95 each. Score!